I have chosen you to be like My Son so you could be part of My family. that he might be the firstborn among many brothers. In today's promise from Romans 8:29, we read in the Amplified Bible the following... For those whom He foreknew [of whom He was aware and loved beforehand], He also destined from the beginning [foreordaining them] to be molded into the image of His Son [and share inwardly His likeness], that He might become the firstborn among many brethren. What an amazing promise! God knew us and loved us and destined us to be part of His amazing family before the creation of the world! It was because of His incredible love, that He determined to mold us into the image of His beloved Son so that we could be part of His wonderful family. Jesus is the firstborn among many brothers and sisters. He is the ultimate big brother to each one of us and His Father has become our Father (John 20:17) because of the finished work of the cross. Hallelujah for such a salvation! We are being conformed day by day into the likeness of our Elder Brother and Savior, Jesus Christ. 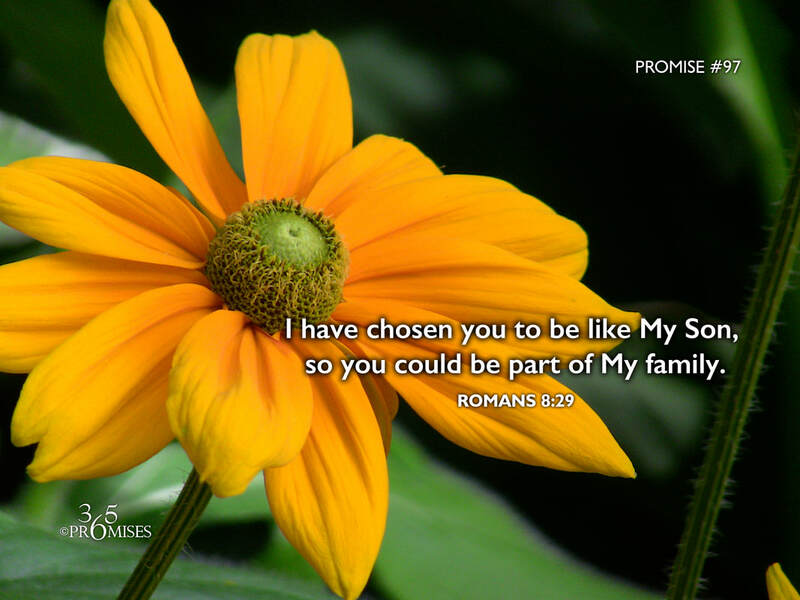 My prayer today is that each and every one of us would know that God chose us before the foundation of the world to become part of His everlasting family. May the reality of this promise transform how we see ourselves, our brothers and sisters, and our Elder Brother Jesus!